“ I have come to the age of 79 and have several health problems, but since I know them to be illusory, I feel no depression or discouragement. Whenever I think of my lama, he is above my head or in my heart, and every benefit and joy comes from that. Love, compassion, and nurturing the nature of mind without distraction is the main point of practice. His Holiness Karmapa advised, for now on when Kyabje Tenga Rinpoche is in Thugdam, to practice "Guru Yoga of four sessions of the day" (the Guru Yoga of the eighth Karmapy) and the prayer "Calling the Lama from Afar” by Jamgön Kongtrul Lodrö Thaye. In Benchen monastery, Kathmandu, Nepal, in addition to these two practices monks and attendants practice also a short “Guru Yoga of the Root Lama Karmapa” composed by Kyabje Tenga Rinpoche. A brief account of the passing of Kyabje Tenga Rinpoche (from: www.benchen.org)His Holiness Karmapa advised, for now on when Kyabje Tenga Rinpoche is in Thugdam, to practice "Guru Yoga of four sessions of the day" (the Guru Yoga of the eighth Karmapy) and the prayer "Calling the Lama from Afar” by Jamgön Kongtrul Lodrö Thaye. In Benchen monastery, Kathmandu, Nepal, in addition to these two practices monks and attendants practice also a short “Guru Yoga of the Root Lama Karmapa” composed by Kyabje Tenga Rinpoche. As you know, Kyabje Tenga Rinpoche had been admitted to hospital on the evening of 26 March. On the 28th, at 5:30 p.m. Rinpoche expressly stated his wish to return to the monastery. The doctors advised him strongly not to do so, owing to the lack of facilities there, and telling Rinpoche quite frankly that they could not guarantee for anything should he choose to leave anyway. However, Rinpoche stood by his decision, which was also confirmed by H.H. the Karmapa's advice shortly thereafter. An ambulance was readied and Rinpoche arrived in the monastery at around 7:00 p.m. Previously, while in the hospital, Rinpoche's situation was quite unbearable. He was in great discomfort and had to be turned every minute. Also, while in the clinic, he could not sleep for even one minute. This situation persisted for a while once he was back home in the monastery until, at 9:30 p.m., he asked Tashi Özer and Sherab Wangchuk to tell everyone to please leave. At around 10:00 p.m. Rinpoche asked specifically for eight persons to be asked to come. They were Tenpa Yarpel, Sherab Wangchuk, Jinpa Lodrö, Tashi Özer, Karma, Lama Geleg, Lama Tsöndrü and Söpa Chöpel. When they went in they found Rinpoche sleeping peacefully and they stayed quietly in his presence until midnight. When Rinpoche awoke shortly after midnight, Sherab Wangchuk informed him that all those requested were present. Rinpoche was then helped to sit up and began to speak his last will. He requested several times that his words be recorded so that there may be no mistake later on. Among Rinpoche's wishes was that some gold objects that had recently been offered to him, be placed inside the large Maitreya statue in the main temple as well as in the golden finial on top of the temple rooves. This has already been done. It was not immediately apparent, but after a while it was noticed that Rinpoche didn't require any moving anymore. He instead sat up very straight and still and did not seem like a sick person any longer. While Rinpoche had previously been feeling very nauseous, all of that was gone and he seemed to be in no more discomfort. Occasionally he would ask for a sip of water or juice. After a little while Tenpa Yarpel was called again and Rinpoche made it very clear that he wished his body to be cremated. Being even more specific, Rinpoche directed that the four fire rituals for the cremation should be conducted by our lamas and monks of Benchen monastery, by Tsike Chokling Rinpoche, by Chökyi Nyima Rinpoche and by Tulku Yönten of Thrangu monastery and their respective monks. Again, a little later Sherab Wangchuk was called and directed to extend Rinpoche's best wishes and aspirations to all of his students in Europe, Malaysia, Singapore, Taiwan and Indonesia, and especially to Mrs. How Yok Bee, Mr. and Mrs. Peter and Nora Rohde-Kvaede and to Mr. Tim Tashi Boldt and family. Yet again a little later Tenpa Yarpel was called. Rinpoche expressly stated that it was his wish that Tenpa Yarpel will be given the rank of Senior Treasurer, while Tashi Özer will be Junior Treasurer of Benchen Monastery. This was put in writing and will be adhered to. By now the night had worn on and it was the early hours of 29 March. At 3:00 a.m. Rinpoche called for his niece Karmo. After that Tenpa Yarpel was called again and asked by Rinpoche to ask Sangyum Dechen, the wife of Tsike Chokling Rinpoche, to be invited for the next morning. Rinpoche stressed again how he wanted his best wishes to be sent to everyone. At 6:00 a.m. H.E. Sangye Nyenpa Rinpoche came and stayed with Tenga Rinpoche until shortly before 9:00 at which time Sangyum Dechen arrived. Rinpoche took note of her arrival but said nothing. At around 9:30 a.m. she asked Rinpoche's permission to leave and was excused. After that Tashi Ozer asked Rinpoche how and when one should begin to look for Rinpoche's next incarnation. Tenga Rinpoche was very explicit about it saying "Ask H.H. the Karmapa! His advice will be very clear." For more than 28 hours Rinpoche had been sitting up very straight and still and for much of that time he seemed to be in deep meditation. At night Tenpa Yarpel was called again into Rinpoche's presence and asked to record his words. It was Tenga Rinpoche's request to Sangye Nyenpa Rinpoche to continuously take care that all the traditional rituals of Benchen Monastery, the dances and pujas etc., will be continued uninterruptedly in the future. Tenpa Yarpel then requested Kyabje Tenpa Rinpoche to please return very quickly, to which Rinpoche smiled and nodded his head. Around 1:00 a.m. Tenga Rinpoche mentioned that he had clearly seen his teachers, the previous 11th Tai Situ Pema Wangchok Gyalpo, the previous Sangye Nyenpa Rinpoche, the previous Dilgo Khyentse Rinpoche and the 2nd Jamgön Kongtrul Palden Khentse Özer before himself. Then, in the early hours of 30 March, at 3:24 a.m. local time to be exact, he finally passed on. H.E. Sangye Nyenpa Rinpoche had visited several more times before that. This day, which is the eighth day of the second Tibetan month, is a day sacred to the Saviouress Tara. When the moment had finally come, Sangye Nyenpa Rinpoche offered the words of the "Clarifying the Thugdam-state" and spoke them directly into Tenga Rinpoche's ear. Accordingly Tenga Rinpoche adjusted his posture slightly, placed his hands in the meditation gesture, and has since entered into the deep meditation that is known as "Thugdam", a meditative state that great realized masters can enter into after their bodies have expired. Right after that Sangye Nyenpa Rinpoche led the recitation of prayers to the Three Jewels and especially the "Calling the Lama from Afar" by Jamgön Kongtrul. Since then the precious advice of H.H. the Karmapa has been received to keep Kyabje Tenga Rinpoche's surroundings very quiet and to allow no visits to the Kudung, the precious remains, for the duration of three days. We will proceed accordingly. Upon Kyabje Tenga Rinpoche's express wish to be cremated and the advice of H.E. Sangye Nyenpa Rinpoche, the date for the cremation has been set for May 18, 2012. Der unter uns lebte und nur für uns lebte. Und seine unermüdliche Arbeit, uns zu helfen. "Ich hatte nie ein Hindernis in meinem Leben"
Und auch sein zweiter Fuß war dabei dahinzugehen. dass er die Wahrheit sagte. Es war ein Akt zu lehren und zu inspirieren. Sein ganzes Leben war eine Unterweisung und ein Beispiel. Wie von Glück begünstigt wir waren! seine Belehrungen und Segnungen zu erhalten. "Hast Du wirklich ein erleuchtetes Wesen gesehen." Ja, das habe ich, wir alle haben es - jenseits aller Zweifel. Wie Bill Karelis schrieb: - The Vidyadhara called Kyabje Tenga Rinpoche "one of the truly joyful ones," and all who knew him can attest to that. It seemed as if joy and compassion just poured out of him. Der Vidhyadara (Trungpa Rinpoche) nannte Khyabje Tenga Rinpoche "einen von den wahrhaft Freudvollen", und jeder, der ihn kannte, kann das bestätigen. Es schien, als würden Freude und Mitgefühl einfach aus ihm herauströmen. Ven. Kyabje Tenga Rinpoche was born in eastern Tibet, the northern snow-enclosure, the cool land of the dharma valleys, the segment of the mandala field known as "the six ranges of lower Dokham" [...] , on the fourth day of the sixth lunar month in the Water-Monkey year of 1932, which coincides with the festival of Chökhor Düchen, the day of the historical Buddha's first turning of the wheel of Dharma in the deer park in Sarnath, India. To be more specific, Rinpoche was born in the region of Dokham known as Ga. His father was descended from the upper eastern clan of the miraculously born Magyal Pomra known as Drong Sekar Gyalpo and their descendants. Rinpoche's father was Gönpo Tobgyal, one of the sons of the then Drong district official. His mothers name was Rigdzin Drölma, who came from the Gegyal Barma family clan. While the baby was in her womb, she dreamed one night of the Drongpa Lama Tendzin Chögyal (Rinpoche's previous incarnation) who gave her a turquoise and told her to wear it around her neck. After that she was in high spirits and experienced no physical discomfort whatsoever. Other than that, says Kyabje Tenga Rinpoche, there were no special signs. So he was told by his mother. The previous 9th Sangye Nyenpa Rinpoche had gone to see the 11th Tai Situpa Pema Wangchok Gyalpo, in order to request the details of the rebirth of the tulku. With his totally unobstructed wisdom eye, Situ Rinpoche clearly beheld the family into which the tulku had been born, which was the same family clan as the previous incarnation's, the fathers name as being Gönpo, and the mothers name as Drölma. He stated the year of the tulkus birth as the Monkey year, that there were wondrous signs accompanying the birth, and said that if one were to search in the eastern direction, the rebirth would surely be found. The 15th Karmapa Kakhyab Dorje had also had visions and provided a letter with his predictions concerning the precious rebirth, the names of the parents, drawings of the family's house etc., which were in total agreement with Situ Rinpoche's pronouncements. Thus the incarnation was unanimously agreed upon. At around age six and seven Rinpoche learned reading and writing from his father. With Lama Pesam, Rinpoche studied a special type of calligraphy according to the Karma Gadri school of painting and writing. He also learned the "Four Session" Guru Yoga practice, as well the "Confession of Misdeeds" etc. by heart. At age 11 to 12, together with relatives, he engaged in a pilgrimage in order to go and behold the Jowo at the Jokhang in Lhasa. At age 14, on the seventh day of the tenth month, Rinpoche finally arrived in Benchen. On the next day, the eighth, he was enthroned by Sangye Nyenpa Rinpoche upon the golden throne of his predecessor, as the authentic rebirth of Drongpa Lama Tendzin Chögyal. Then, staying at the monastery, Rinpoche studied under Khenpo Söpa Tharchin and other tutors. He took him as his spiritual friend and began to initially study the teachings and practices of Cakrasamvara, Vajravarahi and Jinasagara according to the Karma Kagyu tradition. This was followed by Sarvavid Vairocana, Akshobya, Amitayus, the tenth day rituals of Guru Padmasambhava and Shing Kyong Kunga Zhonnu (the special protector of Benchen). Then followed various collections of liturgical texts and the extensive protector rituals, all of which he committed to memory without any difficulties whatsoever. In the same way Rinpoche continued to study the mandalas of Cakrasamvara, Vajravarahi, Jinasagara, Sarvavid Vairocana, Akshobya and the protector Bernagchen. He studied the design and construction of the eight types of stupas and the rituals for their consecration, as well as the design of the fire-hearths for the four activities, the propitiation of the lords of the soil, which is undertaken before any major construction project, and much more. From his uncle, Lama Lodrö Rabsal, he studied the science of medicine. He memorized its tantras and studied the various branches of medical knowledge for a long time. From the old shrine master of Benchen, Chöpön Sönam Lhayag, Rinpoche learned how to make the tormas of the Karma Kagyu tradition, their shapes, colours and how to prepare their many different intricate butter ornaments. From the same master, he also learned the art of drawing and painting deities. So until Tenga Rinpoche was sixteen years old, he was taught by his tutors the teachings and practices of the main yidam deities of the Karma Kagyu tradition, their various rituals such as the preparatory and main empowerments and burnt-offerings, the consecration ceremonies according to various tantras, etc. During this time he was also fortunate to receive the oral transmissions for the collected commentarial literature of Indian masters of old, the Tengyur, the Collected Works of Dza Paltrul Rinpoche in its entirety, and many other transmissions. With the monk Paljor, Rinpoche studied the main philosophical scriptures as well as poetry with great energy. He also learned from him the Abhidharma-kosa and the commentaries of Khenpo Shenga on the 13 great treatises. In the same way, he studied various subjects under Benchen Khenpo Karma Guru. Then, at this relatively young age, Rinpoche became weary of worldly ways and took the truth of impermanence to heart. He realized that it was time to begin practicing and went into the presence of Sangye Nyenpa Rinpoche in order to request a yidam meditation practice from him. Sangye Nyenpa Rinpoche replied that the yidam deity of Rinpoche's previous lives had always been White Tara, and kindly bestowed the empowerment of White Tara upon him one day. From his teacher and spiritual friend Khenpo Söpa Tharchin, Rinpoche received the oral transmission and full instructions on White Tara. He was then advised to enter into a 12 week retreat of continous White Tara recitation. At age 19, Tenga Rinpoche travelled to Palpung, the seat of the Tai Situ Rinpoches in Derge, and received both novice and full monastic ordination in the presence of the 11th Tai Situ Rinpoche Pema Wangchok Gyalpo. At this occasion he was given the name Karma Tendzin Thrinle Namgyal Pal Sangpo. As an auspicious connection for his successful life-long keeping of these ordinations as well as for the perfection of his studies and subsequent teaching activities, Situ Rinpoche also presented him with an old Indian statue of the Buddha, made from precious Li-metal. After this, Tenga Rinpoche eventually returned to his own Benchen monastery. One night Rinpoche dreamed of an extremely clear and blue sky, in the centre of which appeared a garland of Guru Padmasambhava mantras of golden colour which radiated light to all beings. Several month later, Rinpoche traveled to the monastery of Surmang Namgyal Tse, in order to receive the empowerments and reading transmissions of the Rinchen Terdzö collection of terma literature from the 2nd Jamgön Kongtrul Palden Khyentse Öser, aka Karsey Kongtrul. At this time Rinpoche understood his previous dream to mean that at age 25 he should enter into a three-year meditation retreat. With this intention he went into the presence of Sangye Nyenpa Rinpoche and asked for permission to do so. 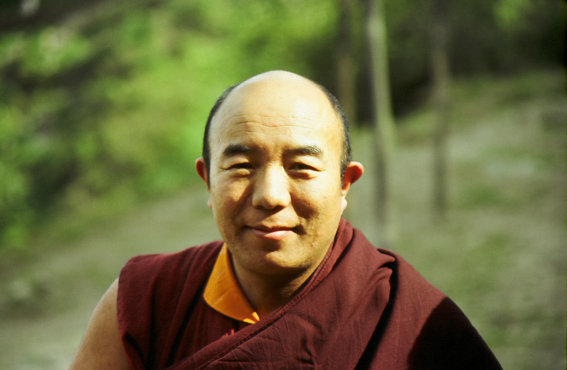 Correspondingly, Tenga Rinpoche entered into retreat and first trained in the four preliminary practices. Then, for the duration of a whole year, he trained mainly in White Tara practice. He dreamed that he arrived at the far shore of a great body of water and was completely freed of the fears and terrors of treacherous paths and the like. In this way many positive signs occurred. In the second year of the retreat, he trained mainly in the outer, inner and innermost practice of Vajrayogini, including the self-empowerment, the accumulation of a hundred thousand tshog offerings and the burnt-offerings, all of which he accomplished extremely well. At that time, Rinpoche dreamed of a girl dressed in red who gave him a triangular red crystal, of great outer and inner luminosity, in the centre of which one could see extremely clearly, the fully developed mandala of Vajrayogini, along with all seed-syllables and mantra-garlands etc. Together with Vajrayogini practice, Tenga Rinpoche also trained in the meditations and yogic exercises of the Six Doctrines of Naropa. While being so engaged, he dreamed of one of the Indian Mahasiddhas of old, who introduced himself as Lawapa. Rinpoche received many instructions from him. While practicing the yoga of dream, he trained in the transformation exercises and thus traveled to the pure realm of White Tara many times. At around that time, Drubwang Sangye Nyenpa Rinpoche had something akin to a prophesy by his Yidam deity, which instructed him to travel to Central Tibet. Not allowing himself to be dissuaded by anyone, he quickly undertook the journey. He let both Benchen Chime Tulku and Tenga Rinpoche know that they should remain at the monastery for the time being. Whatever further teachings and advice they required, would be forthcoming in the future. At this time it would also be wise not to be attached to food or wealth. At the time of great fear and indecision, they should use the divination method of the ARAPATSA-Mo (a method based upon a dice inscribed with the syllables of the Manjushri mantra). [...] Kyabje Tenga Rinpoche could thus just barely finish his three-year retreat. Upon its conclusion he had to flee for the relative safety of Central Tibet immediately. One night, Sangye Nyenpa Rinpoche appeared to Tenga Rinpoche in a dream. He was crossing a mountain ridge with a few attendants, showing a secret path, and when it would be the time to travel that path. Upon waking up, great fear arose all by itself. However, whenever they were beset by great fear or insecurity, they refered to the divination method advised by Sangye Nyenpa, and eventually reached Lhasa and beheld the golden face of Sangye Nyenpa Rinpoche once more. Sangye Nyenpa's attendants then proceeded to Tshurpu, whereas Tenga Rinpoche himself went to the Jokhang (in Lhasa) where he completed 5500 circumambulations. After this he also went to Tshurpu, where he beheld the golden face of the Buddha Karmapa, the previous 16th Karmapa Rangjung Rigpe Dorje. In 1959, the Buddha Karmapa travelled to India, via the indirect route of Bhutan. H.H. was then invited by the king of Sikkim to come and make his residence there. At that time Tenga Rinpoche went to Kalimpong where he met with H.H. Dilgo Khyentse Rinpoche and received from him the empowerments and oral transmissions of the Nyingthig Yabshi and Nyingthig Tsapö, the oral transmission for the 32 volumes of Ju Mipham Rinpoche's Collected Works as well as the Collected Works of Terchen Gyurme Dorje. In Sikkim, he then attended the ripening and liberating empowerments and oral transmissions of both the Kagyü Ngagdzö and Damngag Dzö, given by H.H. the Karmapa in his Rumtek monastery, in a most perfect way, free of any errors or omissions. Furthermore, Rinpoche received from H.H. the complete transmissions of the 9th Karmapa's Chikshe Kündrol collection of empowerments, the Chökyong Logtreng (a collection of protector empowerments), the oral transmission of the Collected Works of the Incomparable Je Gampopa, a complete set of Mahamudra instructions and much more. While in Rumtek, Tenga Rinpoche also received the full transmission of empowerments and readings for the teachings and practices of the Shangpa Kagyu lineage from Kyabje Kalu Rinpoche, a transmission that has always been close to Rinpoche's heart, since the time of his predecessor Tendzin Chögyal. Of the 17 years which Rinpoche spent in Rumtek, he served as H.H. the Karmapa's Vajra Master, or Dorje Lobpön, for nine years. Ven. Kyabje Tenga Rinpoche also accompanied H.H. the Karmapa on his first trip to the West in 1974. One day Rinpoche found himself in the presence of H.H. the Karmapa, who advised him lovingly not to go to many different places at this time, but to remain with him in Rumtek, as some excellent teachings were about to be given. At this time Khenchen Thrangu Rinpoche also resided at Rumtek, and was indeed approached to bestow various teachings upon the monastic community, which he graciously accepted to do. At this time Tenga Rinpoche was 29 years old. From then, until he was 33, he attended daily classes which were extended to the students with great kindness. First they studied teachings by the great Mipham Rinpoche, then the Five Treatises of Lord Maitreya, then the Mula-madhyamika-karika by Lord Nagarjuna and the Madhyamika-vatara by Chandrakirti. Finally they were fortunate to hear explanations on the Madhyamaka-lamkara by the Mahapandita Shantarakshita. This was followed by the Bodhicarya-vatara by Lord Shantideva which was given twice, and by teachings on the Three Precepts, also given twice. Kyabje Tenga Rinpoche says of himself, that it is due to the kindness of Khenchen Thrangu Rinpoche that he himself, "who is like a foolish ox", has understood a little of the dharma. From the Sakya Khenpo Khedrub, Tenga Rinpoche received teachings on Karika, the root text of the Pratimoksha-sutra together with Khenpo Shenga's commentary and teachings on Tsema Rigter, the Treasury of the Science of Epistemology by Sakya Pandita. In the presence of Salje Rinpoche he received Madhyamaka-catu-shataka-shastra-karika together with Khenpo Shenga's commentary, the Profound Inner Meaning by the 3rd Karmapa Rangjung Dorje, Mahayana-uttara-tantra-shastra and Hevajra-tantra, all three with Jamgön Kongtrul's commentaries. This lineage of Salje Rinpoche's comes through his own teacher, Palpung Khyentse Rinpoche, who was a student of the 15th Karmapa Khakyab Dorje, who received these teachings from the 1st Jamgön Kongtrul Lodrö Thaye himself. Since 1976, Tenga Rinpoche has established the Benchen monastery in exile at the foot of the Glorious Svayambunath Stupa in Nepal. This is the seat of both the present 10th Sangye Nyenpa Rinpoche and Kyabje Tenga Rinpoche. In the vicinity of Kathmandu, in Pharping, a sacred place blessed by the presence of Guru Padmasambhava and many other Siddhas of the past, both Rinpoches have established both a three-year retreat centre as well as a Shedra, or monastic university. In 2009 Kyabje Tenga Rinpoche gave the full transmission for the teachings and practices of the Shangpa Kagyu in the monastery in Svayambunath and another three-year retreat centre, for the practices of the Shangpa Kagyu lineage, is now under construction in Pharping. It is hoped to be operational in 2011. In 1977, Rinpoche was fortunate to receive the complete transmission of the Collected Rediscovered Termas of Terchen Dudjom Lingpa from his authentic incarnation, the then head of the Nyingmapa school, H.H. Dudjom Rinpoche Jigdral Yeshe Dorje, in his monastery in Boudhanath, Kathmandu. In the same year, Rinpoche received the transmission of the Damngag Dzö again, this time from the present 12th Tai Situpa. In 1987, H.H. the 14th Dalai Lama Tenzin Gyatso asked Rinpoche to give the parts of the oral transmission of the Tengyur to Trehor Pangor Rinpoche which he was missing, in his Benchen monastery in Nepal. From H.H. the Sakya Tridzin, Tenga Rinpoche received the transmission of the Drubthab Küntü, a collection of the sadhanas of the eight practice lineages of Tibet, compiled by the incomparable Jamyang Khyentse Wangpo. From the great Sakyapa master Chogye Trichen Rinpoche, Tenga Rinpoche received Kalacakra. Other lineages of Kalacakra transmission Rinpoche received from H.H. the Dalai Lama, H.H. Dilgo Khyentse Rinpoche and Kyabje Kalu Rinpoche. Having already received the transmission of various of the rediscovered termas of Chokgyur Lingpa from Kyabje Tulku Urgyen Rinpoche, Tenga Rinpoche hosted the transmission of the entire Chokling Tersar, or Collected Termas of Terchen Chokgyur Lingpa, by Tsikey Chokling Rinpoche, the authentic incarnation of Terchen Chokgyur Lingpa himself, in Svayambunath in 1996. 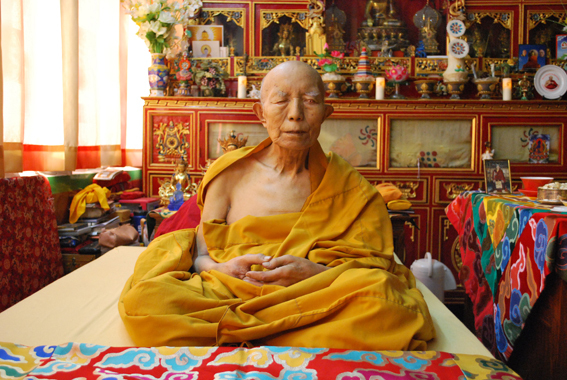 Thus Kyabje Tenga Rinpoche has received countless transmissions from masters of all traditions. In 1978, Rinpoche was asked by H.H. the 16th Karmapa to go to Denmark in order to help the dharma centres there. From there, Rinpoche accepted many invitations and travelled to other centres in Denmark, as well as Germany, France, Greece, etc. In particular, H.H. advised how it would be very beneficial for the future of the transmission of Dharma to Europe if Tenga Rinpoche would establish a large centre in the middle of Germany. Accordingly, Rinpoche established Benchen Phüntsok Ling in 1999. He travels there every year and holds his main summer seminar there, visited by large numbers of students from all over Europe. In previous years, Tenga Rinpoche has also visited South-East Asia, particularly Malaysia, Singapore, Hongkong and Taiwan. While not going there as frequently as to Europe, Rinpoche still visits there occasionally. Since the early nineties, it has been possible to reconstruct the original Benchen monastery in Tibet. Both the 10th Sangye Nyenpa Rinpoche and Kyabje Tenga Rinpoche have put considerable effort into this project. Accordingly, the fully reconstructed Benchen monastery was inaugurated a few years back by the present Sangye Nyenpa Rinpoche. Despite Kyabje Tenga Rinpoche's advanced years, he still continues to travel tirelessly, with the sole aim of benefitting his many students around the world.